Customer portal for job submission and approval. Flexible approval workflow and task routing. Automatic registration for Kodak Prinergy jobs, refined pages and preflight messages. Preflight integration with Enfocus PitStop Server. Job file archiving to Box.com. Automated migration from Kodak InSite. User access control with configurable roles. Document, image and multimedia proofing. Easy deployment – no Java. Vera provides an online portal for users to upload files, manage jobs, request changes, track revisions and give final approval. Set access control for customers, jobs and files, so that users only see what they need to see to complete their approval tasks. The Vera platform is highly customizable. You can configure workflows, user roles and approval states, as well as the portal user interface, terminology and email notifications. Promote your own brand and differentiate your value-added services from competitors. Configure multiple tenants, each with their own distinct branding. Vera includes a translation kit, so you can translate the user interface into any language, including right-to-left languages. Add Vbridge connectors to integrate your Vera system with Kodak Prinergy. Files uploaded through Vera are routed to and processed by Prinergy, including preflight, color management and trapping. Prinergy jobs and refined pages are automatically registered back in Vera for customer approval and preflight messages are displayed while proofing. 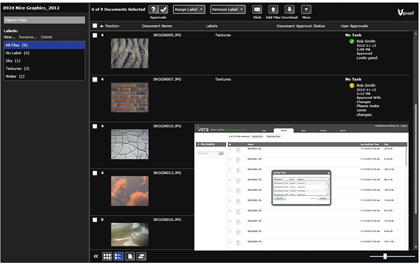 Vbridge integrates with Rules-Based Automation (RBA) to deliver enhanced prepress automation. With Vera you can easily replace your Kodak InSite with a flexible, reliable enterprise-capable system. 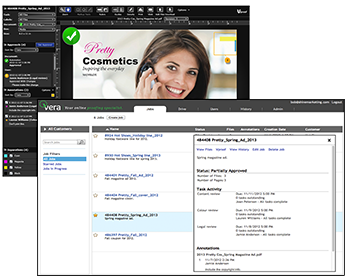 Vera integrates with Enfocus PitStop Server for PDF document preflight and auto-correction, Box.com for cloud-hosted job file archiving, prepress workflow systems such as Esko Automation Engine and Fujifilm XMF, as well as our partners' proprietary business systems. Define your approval workflows with parallel and serial task routing. Create multiple step workflows that assign tasks to users and groups in a predefined sequence. Set due dates and times, task descriptions and available approval states for each step of the workflow. Manage all of the tasks on your to-do list and those you have assigned to others. 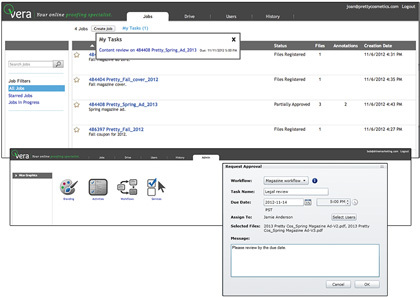 Filter tasks by customer and status, view task details and search for specific tasks. Configurable email notification keeps you and your team informed throughout the review cycle. Receive automated notification when new files arrive, tasks are assigned, annotations are made and approvals are completed, as well as reminders for tasks that are outstanding. 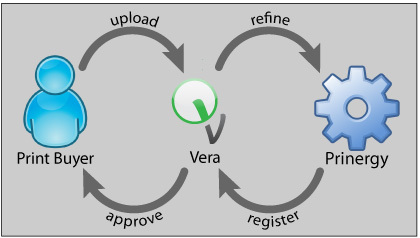 Uploading and downloading files through Vera is quick and reliable with the integrated file transfer technology. Use the Drive tab as a replacement for FTP, where users can search for and transfer files outside of job context.